I love anime music and look forward to the new songs each and every season. 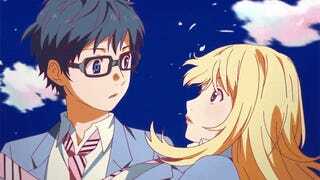 And as there are 50 new anime in the fall 2014 season, we have many new openings and endings to enjoy—not to mention the new second-half themes from last season's anime that are still on the air. So here are my favorite openings and endings from this anime season—along with a few notes about why I enjoy each. Here’s hoping you enjoy them as much as I do. Why Do I Love It? This opening not only has the brightest, most colorful animation of any this season, it also sports an excellent song. It's rare enough to have both male and female vocalists prominent in the same group, but even more rare are mixed ensembles like Goose House that can all sing together to create an awesome, powerful chorus. Why Do I Love It? What starts off almost as a cute ballad builds to a far more powerful piece of J-pop by the chorus. Moreover, the visuals match perfectly to show snippets of the characters and adventure contained within the series. Why Do I Love It? What makes this ending so great isn't the song—okay it isn't just the song. More than anything else, this ending is condensed character development for the character Akatsuki. While she is asleep for the vast majority of the song, we see through the people that visit her and the impact those visits have on her dreams just what kind of person she is and how she views each of them. Why Do I Love It? This triumphant war anthem is a perfect fit for a series about medieval warfare where noble knights battle against armies of the corrupt. Why Do I Love It? Like most of Kalafina’s music, this song thrives on their ethereal vocals and a slow build to a soaring chorus—and that’s exactly what makes it amazing to listen to. Why Do I Love It? This is an exciting, fast-paced J-rock song that uses autotune and the death metal growl to their best effect. It is a perfect theme to get you pumped up for the exciting action-horror hybrid that is Parasyte. Why Do I Love It? Like everything else in Gundam Recognista in G, its ending theme feels like something from an earlier era—in a good way. This song, with its giant kick lines and lyrics that state the name of the anime again and again over an upbeat melody, embodies the spirit of the peaceful world that the protagonist yearns for. Also, it's guaranteed to get stuck in your head. Why Do I Love It? More than an anime song, this theme sounds far more like that of a tokusatsu (Power Rangers/Masked Rider-style) show—which makes sense as this anime is a spin-off of one of those. Then, to bolster the triumphant music, the opening is animated in a colorful, hand-drawn sketch style—making it a treat to both the eyes and ears. Why Do I Love It? This one stands out for simply being chaotic and haunting at the same time—a perfect match for a cyberpunk murder mystery like Psycho Pass.